The type of needle used during a lumbar puncture makes a significant difference in the subsequent occurrence of headache, nerve irritation and hearing disturbance in patients, according to a study by McMaster researchers. 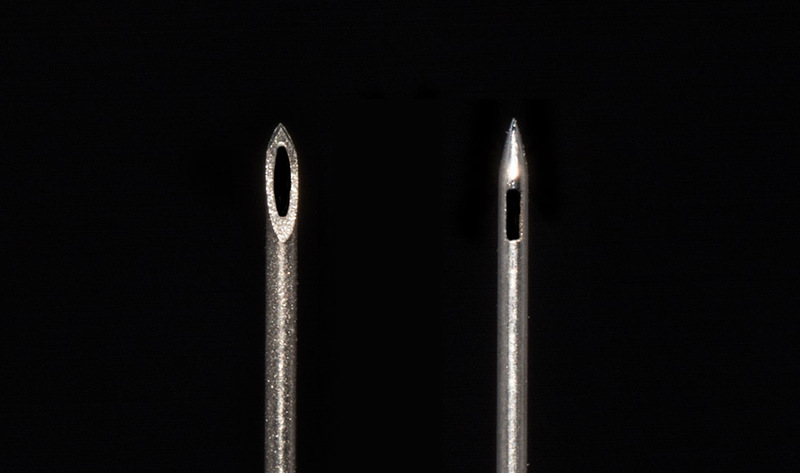 As well, they found the pencil-point atraumatic needle with the better tip design has been available for about 70 years, but few physicians have been using it because they have not been aware of its benefits over the conventional bevelled traumatic needles. The implications on clinical care are huge, said Dr. Saleh Almenawer, the senior author of the study and a neurosurgeon at Hamilton Health Sciences who worked with a team of researchers at McMaster University including Sheila Singh, Alex Koziarz and Siddharth Nath. “There is a more than 50 per cent reduction in the occurrence of headaches with the atraumatic needles, and also more than a 50 per cent reduction in patient readmissions and return to emergency rooms for narcotics or blood patches,” said Almenawer. The study published Dec. 6 in The Lancet says using atraumatic needles rather than conventional traumatic needles for lumbar punctures is just as effective and results in a significant decrease in complications such as the headaches. The type of needle used during a lumbar puncture makes a significant difference in the subsequent occurrence of headache, nerve irritation and hearing disturbance in patients, according to a study by McMaster researchers. As well, they found the pencil-point atraumatic needle with the better tip design has been available for about 70 years, but few physicians have been using it because they have not been aware of its benefits over the conventional bevelled traumatic needles. The implications on clinical care are huge, said Dr. Saleh Almenawer, the senior author of the study and a neurosurgeon at Hamilton Health Sciences who worked with a team of researchers at McMaster University including Sheila Singh, Alex Koziarz and Siddharth Nath. “There is a more than 50 per cent reduction in the occurrence of headaches with the atraumatic needles, and also more than a 50 per cent reduction in patient readmissions and return to emergency rooms for narcotics or blood patches,” said Almenawer. A lumbar puncture, commonly known as a spinal tap, is a regular medical procedure used to diagnose and to treat disease. Post-dural puncture headaches appear in about 35 per cent of patients, sometimes causing debilitating pain that can lead to a return to hospital for painkillers or more invasive treatment. The study published Dec. 6 in <em>The Lancet</em> says using atraumatic needles rather than conventional traumatic needles for lumbar punctures is just as effective and results in a significant decrease in complications such as the headaches. “The two needles differ in how they penetrate the thick membrane, called the dura, surrounding the nerves,” said Almenawer. He explained that the sharp edges of the tip of a conventional needle cuts its way through, while the tip of an atraumatic needle causes the tissue to dilate and contract around it. The tiny hole left in the dura by the atraumatic needle makes it significantly more difficult for cerebrospinal fluid to leak through, thus diminishing the frequency of headaches, readmissions and treatment. The study pooled data from 110 clinical trials, with more than 30,000 participants in 29 countries across the past 28 years. Atraumatic needles have been around for decades, but their use remains significantly limited, according to the researchers. They also found the atraumatic needles cost the same or up to three times as much as the more conventional type. “Several surveys from around the world showed that only a fraction of physicians know atraumatic needles exist, and among those even a smaller portion use the atraumatic type,” said Almenawer. “Lumbar puncture is a standard procedure, with thousands done every day around the globe by physicians of many specialties. Unfortunately, conventional needles created in 1890 are still the default in most hospitals around the world. This study provides convincing high-quality evidence for people to change to the atraumatic needles for a better patient care.” There was no external funding for the study.